Spend tomorrow checking out these fine houses, then sit down with your family and friends to Easter dinner or Passover seder on Sunday. Today is both Good Friday and the first day of Passover, a rare convergence of two of the most widely observed holy days in Christianity and Judaism. As a result, most of the area’s real estate agents are holding off on the big open houses this weekend, saving some of their most delectable properties for next week. And since they figure many of you will be sitting down to either Easter dinner or Passover seder on Sunday (sheesh, they will be too), most of the houses they are showing off will be open today or tomorrow. Here are five of the nicer ones you can tour before your big dinner. Open house: Saturday, April 20th, noon to 1 p.m. This 1980s take on a classic 19th-century Victorian farmhouse sits on a cul-de-sac in the Makefield Road Villa subdivision in Falls Township, which is actually closer to Morrisville than it is to Yardley. It’s in mint condition, with a two-story-high foyer, an updated kitchen, a spacious open-plan main floor, a master suite with California Closets organizers in its closet, and a walkout basement with mini-bar for entertaining. If you like old-timey decor, you’ll appreciate the stenciling and trim along the ceilings of many of the main floor rooms. And you’ll really appreciate its secluded setting and its 1.35-acre wooded lot. Sitting on your roomy rear deck, you’ll be totally oblivious to the existence of Route 1 a short distance away. 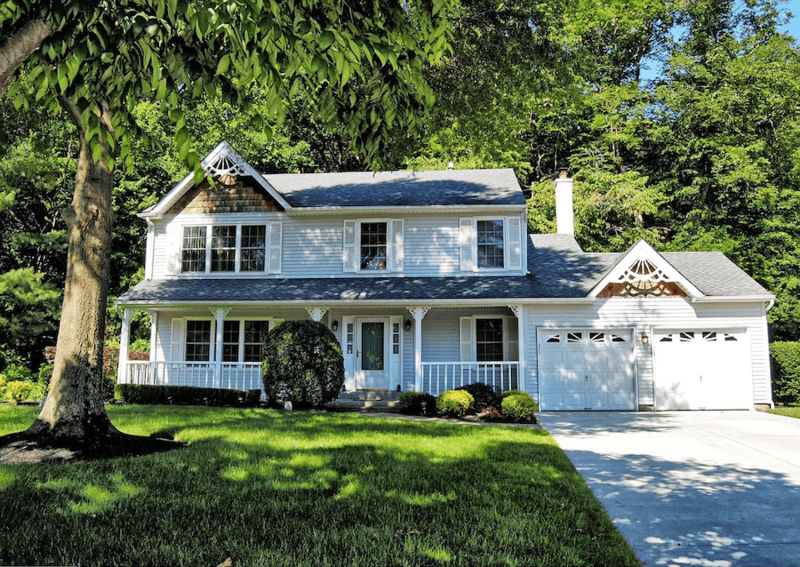 Open house: Saturday, April 20th, noon to 4 p.m. This is the end unit in a row of townhouse condos in the Reserve at West Goshen development, which Francis Iacobucci Properties is busy finishing up. The model unit living room you see above should give you an idea of the quality of design that goes into the townhouses in this development. This particular unit includes a three-stop elevator that serves all floors and the master bedroom, a loft bedroom with balcony, a main-floor bedroom and a large deck. 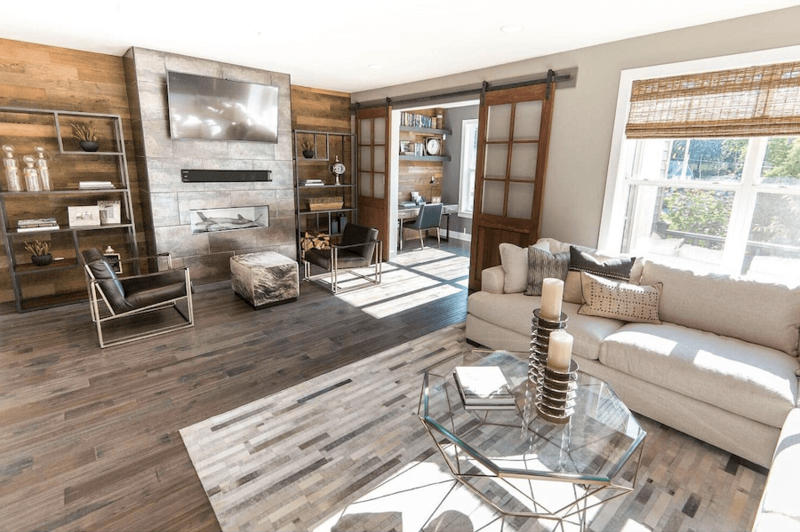 You could buy this unit off the shelf, or if you’d rather customize your interior, you could choose one of the handful of units still being completed. The $150 monthly condo fee covers common area and grounds maintenance. Open house: Saturday, April 20th, noon to 2 p.m. This handsome, two-year-old “Nantucket-inspired” Shingle Style house sits in a great setting: you approach it on a private drive lined by 72 cherry trees, and its three-acre lot overlooks Springton Lake Reservoir. There’s plenty grand about it on the inside as well, starting with the two-story foyer whose spiral staircase is situated in the house’s left front corner. Among the many goodies this house already has are two key accessibility features: an elevator serving all floors and a roll-in shower in the spacious master bathroom. Among those that you can add: a pool and a pool house in back — the agent can supply you with the plans. This handsome and spacious century-old classic stone Colonial “has the Walk Score of a city property,” boasts the (city-based) real estate agent marketing this house. And sure enough, it does: its score of 77 means that you can get most of the things you need to do done on foot, including walk to the Ardmore Regional Rail station to catch the train into town. It combines the expansiveness of the estate homes you find above the Main Line tracks with the convenience of a Downtown Ardmore address. Not only can you walk to so many things you need, you can walk to lots of things you want too, like delectable dining-out options, convivial pubs and live music. But what about the house, you ask? It’s a real looker, with a fresh approach to all the traditional design elements people love about center-hall Colonials. 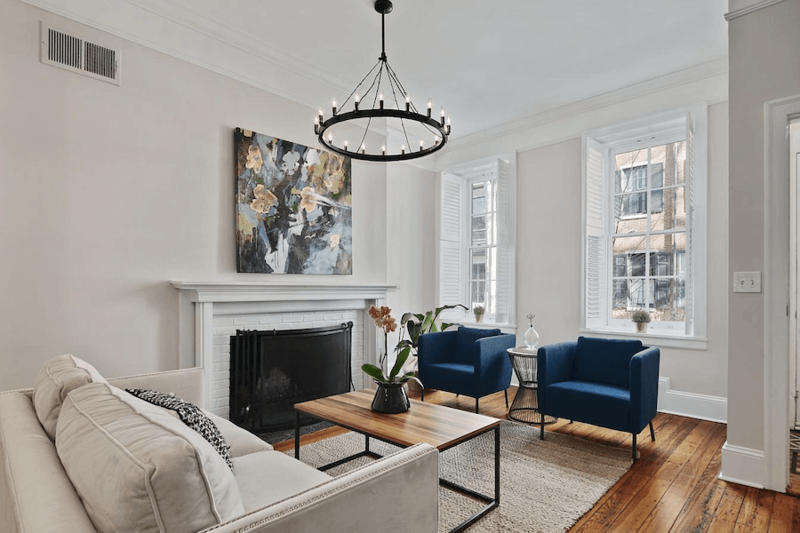 Open house: Saturday, April 20th, 11:30 a.m. to 1 p.m.
And we wrap up this week’s must-see open-house tour by returning again to the most sought-after street in all Center City. This recently renovated 1868 townhouse combines the best elements of modern and traditional design. Its main floor features an open-plan living/dining room and a kitchen with top-drawer appliances, plenty of cabinet storage and bar seating for six. The top-floor master suite is almost a residence in itself, with three custom closets (one a huge walk-in), a marble-bedecked master bathroom, a built-in home office and a private roof deck. Plus there are all those great urban amenities Rittenhouse and Fitler squares have to offer a short walk away.